The Bulletin of the Atomic Scientists agreed the world is less safe than it was two years ago. The atomic bomb was developed by scientists from all levels of academia, and in response to the destruction they wrought, a group of atomic scientists imagined the idea of a Doomsday Clock. The Clock uses the simple imagery of a countdown to midnight to symbolize the peril humans face on our world, with the minute hand moving closer or farther away based on current events. Since it was created in 1947, the Clock has been moved 20 times, the last of which was in 2010 when the election of Barack Obama as President of the United States filled the world with hope. 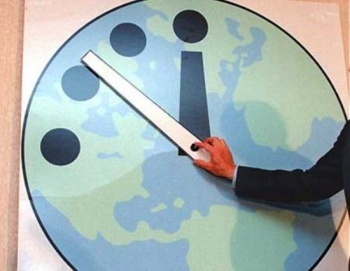 This week, the Doomsday Clock moved back to its position before 2010 - set at 5 minutes to midnight - because of the perceived lack of action on curtailing global warming and reducing nuclear weapons. "It is five minutes to midnight," the official statement from the Bulletin of Atomic Scientists (BAS) read. "Two years ago, it appeared that world leaders might address the truly global threats that we face. In many cases, that trend has not continued or been reversed." "Faced with clear and present dangers of nuclear proliferation and climate change, and the need to find sustainable and safe sources of energy, world leaders are failing to change business as usual," said Lawrence Krauss, a board member of the BAS. "The global community may be near a point of no return in efforts to prevent catastrophe from changes in Earth's atmosphere," said Allison Macfarlane, a BAS member from George Mason University. "Since fossil-fuel burning power plants and infrastructure built in 2012-2020 will produce energy-and emissions-for 40 to 50 years, the actions taken in the next few years will set us on a path that will be impossible to redirect. Even if policy leaders decide in the future to reduce reliance on carbon-emitting technologies, it will be too late." In 1947, the Clock was set at 7 minutes to midnight, but it quickly moved to 2 minutes after both the U.S. and the Sovieet Union tested nuclear weapons. Despite the Bay of Pigs incident in Cuba, the Clock reached one of its highest settings in 1963 at 12 minutes to midnight, before eventually falling to 3 minutes in the 80s at the height of the Cold War. The fall of the Berlin Wall and the dissolution of the Soviet Union allowed the Doomsday Clock to be set the farthest away from midnight - 17 minutes - in 1991. That hopeful feeling slowly eroded away as nations like Pakistan, India and North Korea developed nuclear weapons to 5 minutes to midnight in 2007. While I find the image of the Doomsday Clock compelling, all the Clock really is just a bunch of scientists trying to equate their fears into policy. I can't honestly say that we're closer to the end of the human race today than we were 24 months ago. I'm also pretty sure the Mayan calendar means we're technically much closer to the end of the all life on Earth, and I'd rather trust those guys. I mean, they had much cooler hats.